The survey is sponsored by the National Down Syndrome Society, National Center for Learning Disabilities, Autism Society of America, Autism National Committee, and The Advocacy Institute. It seeks input from parents, self-advocates, and attorneys and advocates who work with parents regarding the major issues in special education advocacy, including IEPs, Child Find/Evaluations, and Due Process/Litigation. The survey also examines whether parents are treated as equals in the process and whether their rights are protected. There are surveys for all community members: Parents of children with disabilities, Attorneys, Advocates, Educational Consultants, other Professionals and Self-advocates (people with disabilities). Thank you for taking the time to participate in this valuable survey. 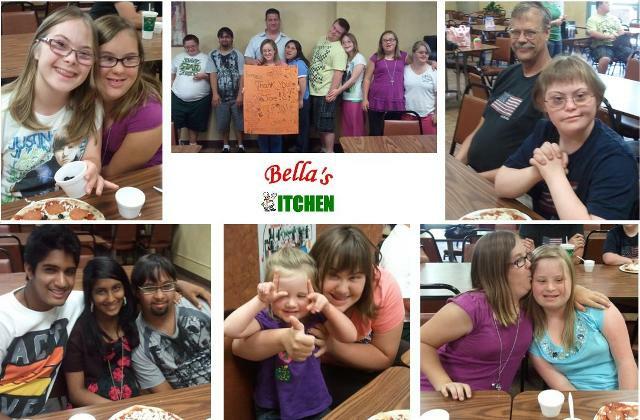 Saturday’s ‘Teen & Adult’ event at Bella’s Kitchen was a BLAST! For the fifth year in a row, the owner of Bella’s Kitchen in Orange, Joe D’Angelo, opened up his restaurant on a Saturday just for DSAOC families. Teens & Adults, along with their younger siblings, topped their own personal sized pizzas and then went back to the kitchen to see how they are cooked to perfection! The rest of the family members in attendance got to enjoy delicious pizzas prepared by the chef. If you couldn’t join us this year, watch your DSAOC Fridge Post and e-mails for next year’s Bella’s Kitchen event. Posted in Uncategorized | Comments Off on Saturday’s ‘Teen & Adult’ event at Bella’s Kitchen was a BLAST! Brothers, Robert and Cody, show support for their little brother Ayden. On a beautiful Saturday this past May, brothers Robert and Cody, along with their little brother Ayden who has Down syndrome, sat outside their home from 7:30 a.m. until 3 p.m. selling adorable dancing solar flowers to their neighbors and passers by. The sign read, “Support for Down Syndrome”, with all the proceeds benefitting the Down Syndrome Association of Orange County (DSAOC). 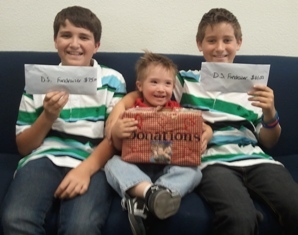 DSAOC was thrilled to receive $136 from their efforts, but moreover, we were thrilled to see the love and brotherly bond that exists between them. Thank you, Robert, Cody and Ayden! 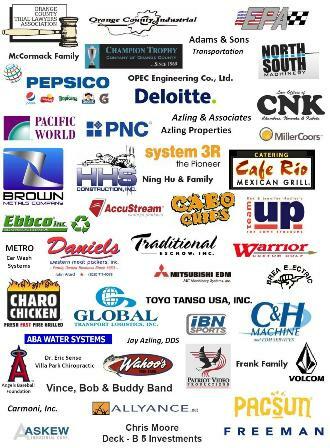 We look forward to seeing all of you that have registered for golf and/or the “After Golf” party on Monday, June 13! Be sure to pull out your luau attire (optional) and we will see you at Los Coyotes Country Club, 8888 Los Coyotes Drive, Buena Park 90621. Banquet festivities on the terrace begin at 4:30 p.m. The Banquet doors open at 6 p.m. Your dinner ticket includes light hors d’oeuvres, cash bar, and live entertainment on the terrace provided by the Vince, Bob & Buddy Band. 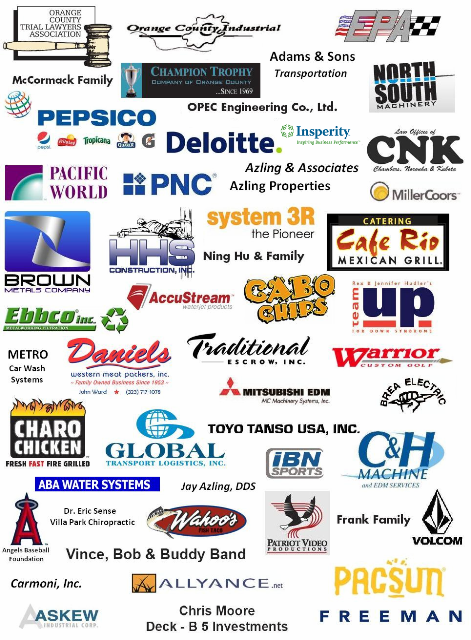 You will have access to the exciting auctions led by comedian, Robert G. Lee, and enjoy a delicious Hawaiian themed dinner – all while supporting the mission of DSAOC.